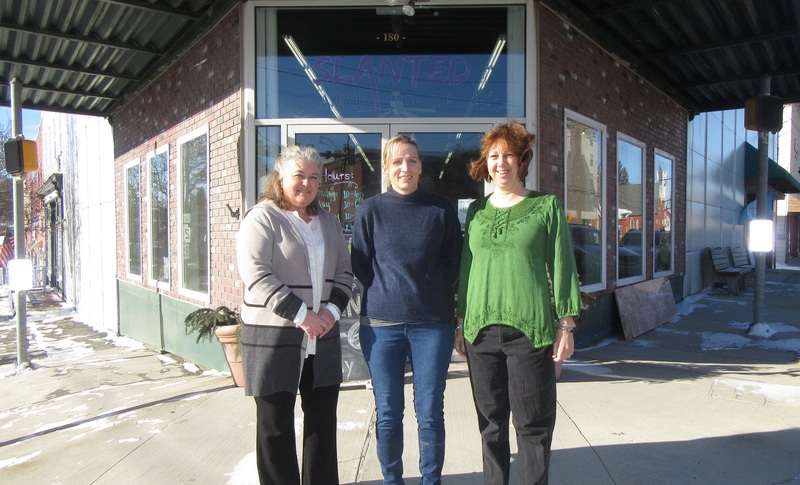 Slanted Art Coop members (top, from left) Penny Eldred, Kathy Taylor and Susan Zellner invite art lovers to check out the wide array of items at the recently opened shop at the corner of Church Street and Public Avenue in Montrose. A grand re-opening celebration is slated for Saturday, Feb. 2. 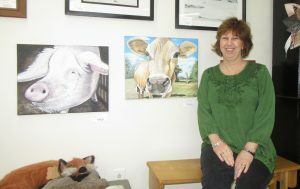 Always supportive of their fellow artisans, Susan Zellner (above) relaxes next to a few of her favorite paintings by Kathy Taylor. 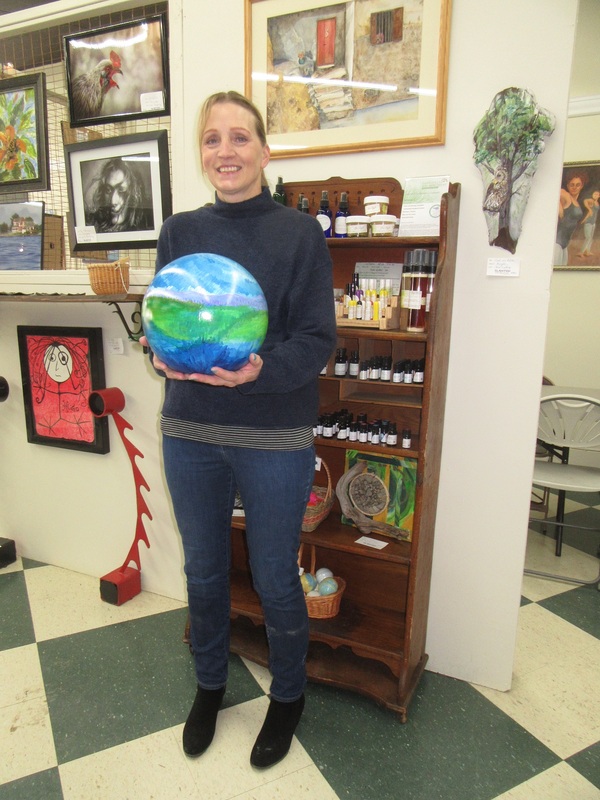 Co-op member Kathy Taylor (below) holds a globe created by Penny Eldred. As members of the Slanted Art Co-Op in Montrose get used to their new space, they are planning several events to engage artists of all skill levels in a variety of genres. 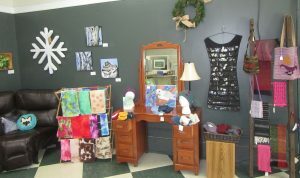 More than 25 artisans currently have works on display for purchase at 180 Church Street, and each is sharing their unique styles and gaining confidence in trying new things. “You can do more as a group than as individuals,” co-op partner Penny Eldred related. One thing that immediately sets the shop apart to visitors is that there are no booths or cubicles. Paintings, sculptures, baskets, dyed scarves and three-dimensional works are exhibited among jewelry, ceramics, walking sticks, fiber art and a wide variety of “up-cycled” pieces, the latter a term for offerings in many genres fashioned from found items. “We do that intentionally. 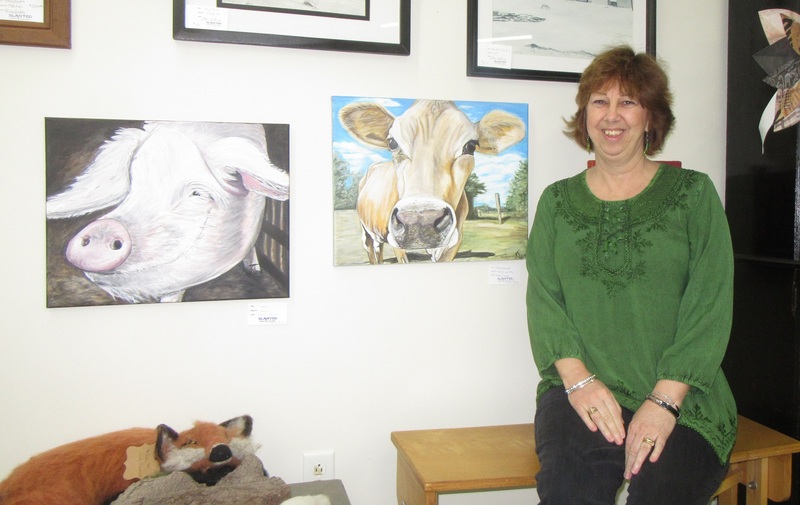 We love people to walk around and see and experience everything,” said Susan Zellner, another of the four partners that include Victoria Roberge and Samantha Ellsworth. Regular business hours for the co-op are Thursdays and Fridays from 10 am to 6 pm, Saturdays from 10 to 2, and Sunday afternoons from 1 to 4 pm. A series of special events will extend shop hours, as will every Third Friday in Montrose. On Friday, Jan. 18, Eldred will conduct an acrylic pour painting class from 6 to 8 pm. Cost per participant is fifteen dollars, and those who are interested are encouraged to preregister at 570-243-1075 so the classroom and supplies can be arranged accordingly. One night prior, featured artist John Eidenier, who excels in both painting and poetry, will read selections from his book “Love,” copies of which are available for purchase at the store. 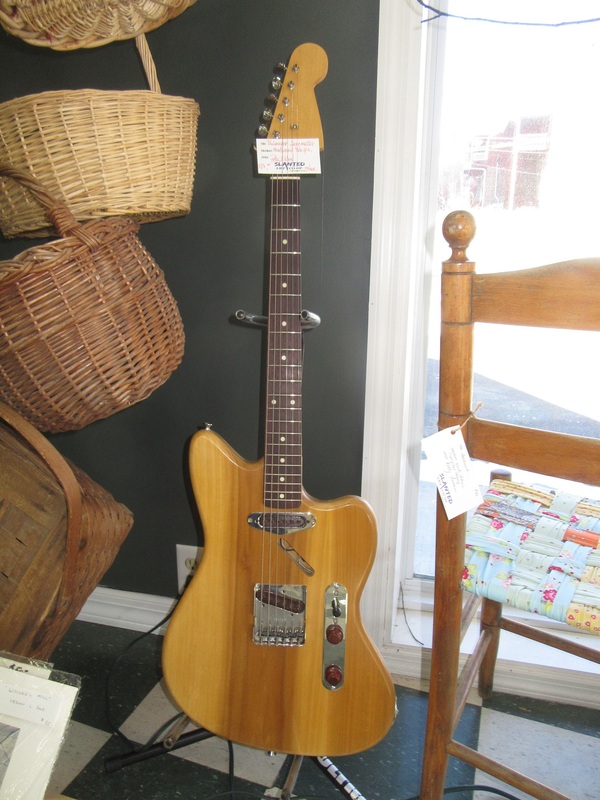 Featured artists for each month do get a special spot in the shop to showcase their talents. 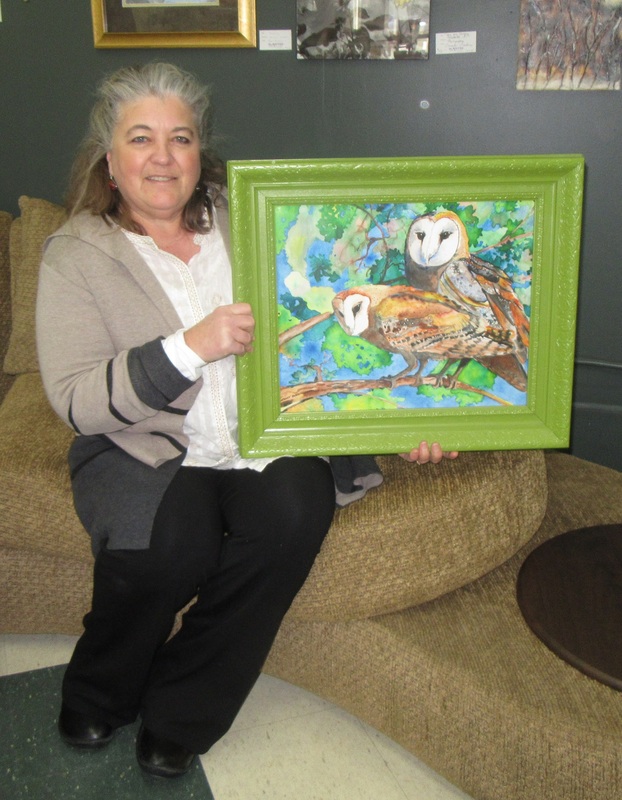 To celebrate their move from South Main Street, Slanted Art Co-Op members will hold a grand reopening on Saturday, Feb. 2 from 10 am to 4 pm. Penny Eldred will conduct another painting class, and her husband Peter, who both reconditions and builds guitars (example below) from scratch, will provide live entertainment. Refreshments will be available at every special event, and co-op members hope to conduct at least two classes per month. The new location at the intersection of South Main and Church streets provides large display windows that give passersby a peak inside and let in abundant daylight to brighten up the works on display. To keep up with everything going on at the Slanted Art Co-Op, interested readers may follow the business on Facebook, where a new website will soon be announced. 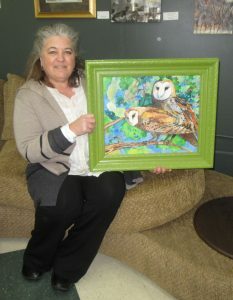 Penny Eldred exhibits a painting by co-op member Sarrah Dibble Camburn.